Firefighters were seen dousing flames on the roof of a building after a fire broke out at a Jurong West coffee shop yesterday morning. The Singapore Civil Defence Force (SCDF) said it was alerted to the fire at Block 964 Jurong West Street 91 at around 9am. The flames were extinguished using a water jet and a hose reel, the SCDF said, adding that no injuries were reported. 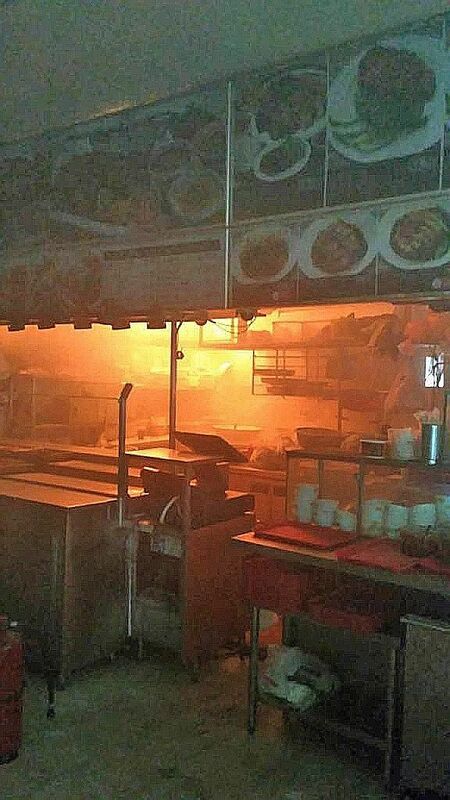 The Straits Times understands that the fire involved a ventilation duct at the coffee shop. A resident named Madam Salju, who lives across the road from the coffee shop, said that she was working at home at around 9.15am when her maid told her about the fire. The 53-year-old looked out the window and saw that the blaze was "quite big", with thick smoke billowing from the coffee shop. "It was raining heavily, but the fire didn't stop - it just got bigger," she told ST.
She said the roof of the building was charred and blackened. A cleaner at the coffee shop, which has about 15 stalls, told ST that the fire started at a stall selling economy rice. A 39-year-old assistant at the stall, who wanted to be known only as Mr Tan, said that he was cutting vegetables at around 8.45am when a pot of oil caught fire. The blaze quickly spread up to the exhaust hood, he added. Stallholders helped to put out the flames on the stove with a fire extinguisher, but the fire in the exhaust hood was too high. A witness who did not want to be named said that the fire also spread to a Western food stall before SCDF officers were able to put out the blaze at about 9.20am. Another witness, who wanted to be known only as Madam Tay, said that several stallholders were still selling food after the fire started. There were a few patrons around and they left only when the police arrived and told them to evacuate the area, she said. Videos sent to ST show the coffee shop shrouded in smoke with firefighting operations under way. Tiles on part of the roof were dislodged and fell onto a few stalls. The SCDF said that the cause of the fire is being investigated.